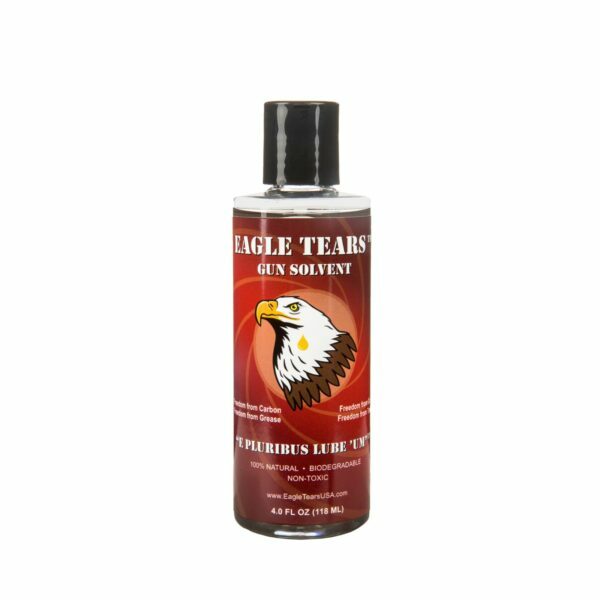 “A clean gun is a happy gun, and a happy gun is a happy shooter.” Eagle Tears Gun Solvent will bring happiness to both of you. Made from distilled citrus oil and a proprietary blend of emulsifying oils, our solvent is all-natural and non-toxic. Eagle Tears Gun Solvent cuts through carbon gunk and grease like a politician goes through someone else’s money. Our solvent can be diluted with up to 50% water, as long as it is well shaken. Use at full strength for tough jobs, or dilute it for lighter cleaning. Also works great on firearms that use black powder, or black powder substitutes. After cleaning, apply a light coat of Eagle Tears Gun Oil. NOT FOR INTERNAL USE. KEEP OUT OF THE REACH OF CHILDREN. I absolutely love the Eagle Tears Gun solvent! I cleaned my gun with another product, and then went back and cleaned it again with Eagle Tears and it did a better job. Oh and it doesn’t have that “FUNKY SMELL” either. It also doesn’t burn your hands if you have a cut on them. I highly recommend this product to everyone!